Lawn signs are taking over Bentonville, Arkansas. Blue and green, staked in yards and hung in windows, they're everywhere you turn, in parks, outside homes, at local businesses. "Glad you're here," they proclaim, a jubilant welcome to this, the home of the retailer that famously put greeters at the door of every one of its stores. They're here because Crystal Bridges, the ambitious new museum of American art conceived by Walmart heir Alice Walton is here, and because that's likely why you're here too. The museum, which opened on November 11, 2011, aims to collect and promote American art and serve as a cultural touchstone in this Northwest corner of the state, not far from Tulsa, Oklahoma and Joplin, Missouri. But it's also rapidly lifting the profile of this Ozark town of 35,000, attracting the attention of travelers and art snobs around the world. And that coming influx, the tourist surge on the horizon, is, right now, changing the fabric of Bentonville in unprecedented ways. The catalyst is the museum, a 201,000-square-foot architectural gem by Moshe Safdie designed not just to hold Walton's huge collection of American art but also to serve as a stand-alone destination, a pilgrimage site for the cognoscenti on par with Louisiana in Denmark, the Skirball Center and the Getty Center outside Los Angeles and the Chinati Foundation in Marfa, Texas, places where visitors do more than just see the art and leave. At these new museums, visitors are invited to linger, wander, eat, drink and shop. While all these destination museums have much in common, Crystal Bridges shares a particular symmetry with Chinati, another notable institution dropped into a place with few. "We didn't have museums when I was growing up," Walton told Star-Telegram art critic Gaile Robinson in November. "The most important thing to me is to bring opportunities to people that don't have them." On my non-stop flight from New York to Bentonville, there are 11 passengers, including me, which makes the crew-to-passenger ratio roughly one to four. Once above the clouds, I open up my laptop to watch "Exit Through The Gift Shop," the Banksy documentary that I downloaded last year and never got around to watching. As I watch, I wonder if there will be any street art at Crystal Bridges. Later in the movie, narrator Rhys Ifans says I should expect some: "Now no serious contemporary art collection would be complete... Without a Banksy." And yet Alice Walton begs to differ: While her museum holds some contemporary art, there was nary a piece of street art in sight. Crystal Bridges doesn't purport to be the end-all be all. It is exclusively focused on American art, the collection of which has been one of Walton's all-consuming passions. The aim, writes Roberta Smith in The New York Times, "is to tie together American art and history and the immediate experience of nature in a compelling and accessible way, one that still keeps the art very much in the foreground." Indeed the museum's engrossing collection is only part of the experience. The 120-acre grounds offer miles of walking and biking paths, as well as outdoor installations. The museum restaurant is a novel and worthy addition to the local dining scene, in a breathtaking hall that seems to float over the shallow ponds at the heart of the museum complex. A gift shop, despite Banksy's insistence, isn't a requisite stop on visitors' walk through the galleries. Rethinking the museum experience and drawing on lessons learned at Louisiana and Skirball was a deliberate part of Safdie's design, according to a small exhibit on the architecture in Crystal Bridges' south wing. "We're learning that this is many peoples' first experience with a museum," says Laura Jacobs, the museum's Director of Communications. While 80 percent of visitors say it's their first visit to the two-month old museum, Jacobs adds that there is already a growing number of second-time visitors, the majority of whom are "coming from our local zip codes," thanks in part to free admission, which is sponsored by the Walmart Foundation, a group independent from the Walton Family Foundation that financed Crystal Bridges. "We've gotten -- and I'm not exaggerating -- hundreds of letters from people," thanking the museum for free admission Jacobs says. Their annual attendance goal for the museum is 250,000. As of January 24, Jacobs tells me, "We've had 121,888 people visit since we've opened." "Little Rock was for so long the only metropolitan area in the state," says Doug Smith, an associate editor at the Arkansas Times whose cover story, "Is Bentonville the New Fayetteville?," ran in June 2011 and detailed the many changes sweeping across Northwest Arkansas ahead of the museum's opening. "I can remember when Bentonville was like 2,000 people and [nearby] Rogers not much bigger," Smith says. "There's just a lot of cultural change that is going on," he adds, citing a growing Latino population and a growing diversity of religious institutions. But the most noticeable boom in Bentonville is its new local businesses, particularly those downtown around an area known simply as The Square, which was rebuilt in 2008 during Mayor Bob McCaslin's first term. "That served really as the first motivation to those in and around the square that, 'Hey, that really looks nice. We could dress up our business,'" McCaslin says. "So it was something sort of contagious that took place." A year ago, there were two restaurants downtown. Now there are five, including Tusk and Trotter, a restaurant and bar that opened in June. It's a spacious place -- Sam Walton once used it as a warehouse -- but families and young couples alike pack the bar. On a recent Friday night, a young girl painted watercolors with her mom next to a microbrew fiend who couldn't stop bending the bartender's ear. Pressroom, which opened in October, has a big and beautiful bar, well-stocked for customers who want to linger -- and linger over bottles of wine, which are displayed prominently along with decanters and fancy stemware. There are even food trucks of a sort: Crepes Paulette, which serves both sweet and savory varieties, is open a few days a week, and Pedal Pops, a frozen paleta operation that wasn't on the streets during my wintery weekend visit, sells biscotti and candies, too. "Crystal Bridges will serve as a catalyst to promote a new level of development that's never been seen in Northwest Arkansas," McCaslin says. "This is truly a world-class facility dropped into a state that's typically not known for that. So, the paradigms will change in that regard." The economic impact is already being felt: November's hotel tax receipts are up 23 percent and restaurant tax receipts up 12 percent compared to last November, reports the Associated Press. "Clearly [we're] seeing some signs that these two engines, the restaurant and the hotel/motel industry are certainly showing signs of recovery," the mayor says. "That's an indication that something is going on -- and it's welcome." In a statement released days after President Obama’s pro-tourism speech at Disney World on January 19, Ed Clifford, president and chief executive officer of Bentonville and Bella Vista Chamber, credits travel to downtown Bentonville with the creation of 123 jobs, a not insignificant number in a town of 35,000. "I tell people -- and I'm not the world traveler, don't get me wrong -- but I don't know of another city anywhere that has a brighter future than Bentonville, Arkansas," McCaslin says. "Everything here is poised to be outstanding if not exceptional over the next decade-plus." At the breakfast table of Laughlin House, every single person was in town for the museum and everyone had rave reviews. (I was the only one that flew in; the other guests lived within a day's drive.) It's admittedly cheap to base my opinion on one breakfast, but the hopes for the future of the business hang on the success of the museum in drawing out-of-towners to the area. Owner Jenny Wallace, who opened Laughlin House with her husband, Don, in July told The New York Times in December, "We purchased the house fully anticipating that Crystal Bridges might be a draw." She echoes that statement now. 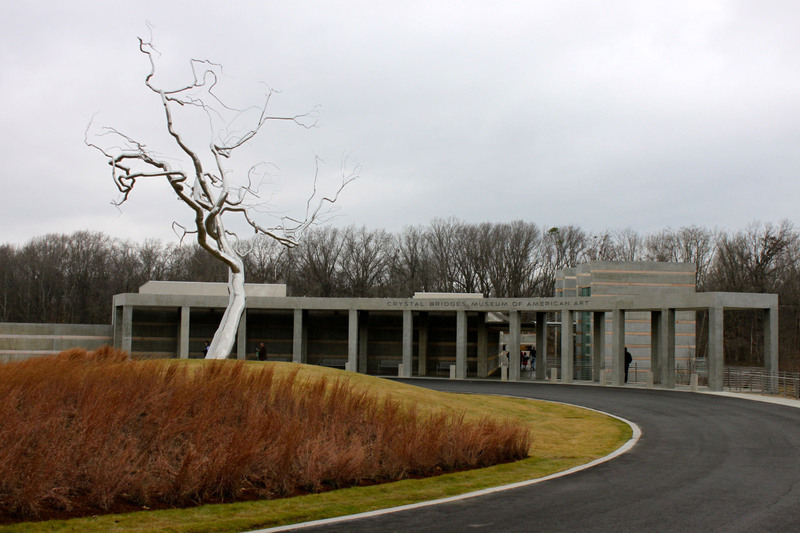 "Before Crystal Bridges opened, we were getting trickles of people in," Wallace tells me. "When Crystal Bridges opened, it was like the floodgates opened. And I know that the area restaurants are seeing an increase as well." Other hotels are banking on it: Construction on the new 21c Museum Hotel is well under way, near Compton Gardens, the starting point of a bike-and-pedestrian trail to Crystal Bridges. When it opens in 2013, it will be the third property from 21c, the original location of which opened in Louisville in 2006 and quickly garnered critical acclaim for putting contemporary art exhibits inside a high-end boutique hotel. The new 21c will add 104 rooms to the local hotel market, currently dominated by name-brand chains that dot Walton Boulevard. "This is a boutique hotel," the mayor reminds me. "I think it's recognizing ahead of the demand that there will be a different clientele, perhaps, that comes to visit the hotel or to visit the museum," then comes to do business with Walmart. And yet much of Bentonville remains as it was before the museum opened. Walmart logos are everywhere, on signs, on office parks, on the sides of trucks backed up to loading bays. (A Walmart visitors center sits inside one of Sam Walton's old five-and-dime shops on The Square.) And the proximity to cattle country is clear at Doe's Eat Place, a Down South relic that serves steaks by the pound to rabid regulars. Doe's takes its aged, house-butchered steaks seriously: No fewer than four people asked if my ribeye was properly cooked once the enormous $45 bone-in cut emerged from the broiler. It was most certainly properly cooked. "We're just so excited about all of the changes that are going on in the downtown area," Wallace tells me. "We just feel so blessed and lucky to have opened when we did to get all the attention that we're getting as a result of Crystal Bridges." "There's been a contagious excitement in Bentonville, I believe since 2008," McCaslin says. "We hope [that] over the next decade, two decades or greater, we start enjoying the benefits of those visitors that will come, many of them coming to Arkansas for the first time." "Our mission is to have people enchanted not only with the bed and breakfast but with Bentonville," Wallace adds. "And to want to come back."